IndexedDB is a built-in database, much more powerful than localStorage. Key/value storage: value can be (almost) anything, multiple key types. Supports key range queries, indexes. Can store much more data than localStorage. That power is usually excessive for traditional client-server apps. IndexedDB is intended for offline apps, to be combined with ServiceWorkers and other technologies. The native interface to IndexedDB, described in the specification https://www.w3.org/TR/IndexedDB, is event-based. We can also use async/await with the help of a promise-based wrapper, like https://github.com/jakearchibald/idb. That’s pretty convenient, but the wrapper is not perfect, it can’t replace events for all cases, so we’ll start with events, and then use the wrapper. To start working with IndexedDB, we need to open a database. name – a string, the database name. version – a positive integer version, by default 1 (explained below). We can have many databases with different names, all within the current origin (domain/protocol/port). So different websites can’t access databases of each other. success: database is ready, use the database object openRequest.result for further work. upgradeneeded: database version is outdated (see below). IndexedDB has a built-in mechanism of “schema versioning”, absent in server-side databases. Unlike server-side databases, IndexedDB is client-side, we don’t have the data at hands. But when we publish a new version of our app, we may need to update the database. If the local database version is less than specified in open, then a special event upgradeneeded is triggered, and we can compare versions and upgrade data structures as needed. The event also triggers when the database did not exist yet, so we can perform initialization. After openRequest.onsuccess we have the database object in openRequest.result, that we’ll use for further operations. 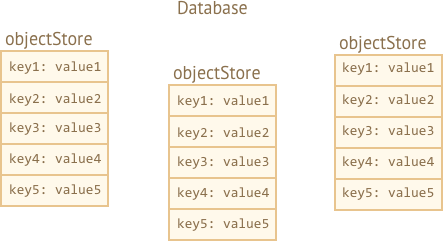 An object store is a core concept of IndexedDB. Counterparts in other databases are called “tables” or “collections”. It’s where the data is stored. A database may have multiple stores: one for users, another one for goods, etc. Despite being named an “object store”, primitives can be stored too. We can store almost any value, including complex objects. IndexedDB uses the standard serialization algorithm to clone-and-store an object. It’s like JSON.stringify, but more powerful, capable of storing much more datatypes. An example of object that can’t be stored: an object with circular references. Such objects are not serializable. JSON.stringify also fails for such objects. There must be an unique key for every value in the store. A key must have a type one of: number, date, string, binary, or array. It’s a unique object identifier: we can search/remove/update values by the key. We can provide a key when we add an value to the store, similar to localStorage. That’s good for storing primitive values. But when we store objects, IndexedDB allows to setup an object property as the key, that’s much more convenient. Or we can auto-generate keys. Please note, the operation is synchronous, no await needed. keyPath – a path to an object property that IndexedDB will use as the key, e.g. id. autoIncrement – if true, then the key for a newly stored object is generated automatically, as an ever-incrementing number. If we don’t supply any options, then we’ll need to provide a key explicitly later, when storing an object. An object store can only be created/modified while updating the DB version, in upgradeneeded handler. That’s a technical limitation. Outside of the handler we’ll be able to add/remove/update the data, but object stores are changed only during version update. We can compare versions and run per-version operations. Or we can get a list of existing object stores as db.objectStoreNames. That object is a DOMStringList, and it provides contains(name) method to check for the existance. And then we can do updates depending on what exists. The term “transaction” is generic, used in many kinds of databases. A transaction is a group operations, that should either all succeed or all fail. Subtract the money from their account. Add the item to their inventory. It would be pretty bad if we complete the 1st operation, and then something goes wrong, e.g. lights out, and we fail to do the 2nd. Both should either succeed (purchase complete, good!) or both fail (at least the person kept their money, so they can retry). All data operations must be made within a transaction in IndexedDB. store is a store name that the transaction is going to access, e.g. "books". Can be an array of store names if we’re going to access multiple stores. readonly – can only read, the default. readwrite – can only read and write, but not modify object stores. There’is also versionchange transaction type: such transactions can do everything, but we can’t create them manually. IndexedDB automatically creates a versionchange transaction when opening the database, for updateneeded handler. That’s why it’s a single place where we can update the database structure, create/remove object stores. What are transaction types for? Performance is the reason why transactions need to be labeled either readonly and readwrite. Many readonly transactions can access concurrently the same store, but readwrite transactions can’t. A readwrite transaction “locks” the store for writing. The next transaction must wait before the previous one finishes before accessing the same store. Create a transaction, mention all stores it’s going to access, at (1). Get the store object using transaction.objectStore(name), at (2). Perform the request to the object store books.add(book), at (3). …Handle request success/error (4), make other requests if needed, etc. put(value, [key]) Add the value to the store. The key is supplied only if the object store did not have keyPath or autoIncrement option. If there’s already a value with same key, it will be replaced. add(value, [key]) Same as put, but if there’s already a value with the same key, then the request fails, and an error with the name "ConstraintError" is generated. Just like when opening a database, we send a request: books.add(book), and then wait for success/error events. The request.result for add is the key of the new object. The error is in request.error (if any). In the example above we started the transaction and made add request. We could make more requests. How do we finish (“commit”) the transaction? The short answer is: we don’t. In the next version 3.0 of the specification, there will probably be a manual way to finish the transaction, but right now in 2.0 there isn’t. When all transaction requests are finished, and the 記事 "microtask-queue" が見つかりません is empty, it is committed automatically. What’s an “empty microtask queue”? The microtask queue is explained in another chapter. In short, an empty microtask queue means that for all settled promises their .then/catch/finally handlers are executed. In other words, handling of finished promises and resuming “awaits” is done before closing the transaction. That’s a minor technical detail. If we’re using async/await instead of low-level promise calls, then we can assume that a transaction commits when all its requests are done, and the current code finishes. So, in the example above no special code is needed to finish the transaction. Transactions auto-commit principle has an important side effect. We can’t insert an async operation like fetch, setTimeout in the middle of transaction. IndexedDB will not keep the transaction waiting till these are done. That’s because fetch is an asynchronous operation, a macrotask. Transactions are closed before the browser starts doing macrotasks. Authors of IndexedDB spec believe that transactions should be short-lived. Mostly for performance reasons. Notably, readwrite transactions “lock” the stores for writing. So if one part of application initiated readwrite on books object store, then another part that wants to do the same has to wait: the new transaction “hangs” till the first one is done. That can lead to strange delays if transactions take a long time. In the example above we could make a new db.transaction right before the new request (*). But it will be even better, if we’d like to keep the operations together, in one transaction, to split apart IndexedDB transactions and “other” async stuff. First, make fetch, prepare the data if needed, afterwards create a transaction and perform all the database requests, it’ll work then. Only complete guarantees that the transaction is saved as a whole. Individual requests may succeed, but the final write operation may go wrong (e.g. I/O error or something). That cancels all modification made by the requests in it and triggers transaction.onabort event. That’s to be expected, not only because of possible errors at our side, but also for reasons not related to the transaction itself. For instance, the storage quota may be exceeded. So we must be ready to handle such case. A failed request automatically aborts the transaction, canceling all its changes. Sometimes a request may fail with a non-critical error. We’d like to handle it in request.onerror and continue the transaction. Then, to prevent the transaction abort, we should call event.preventDefault(). Do we need onerror/onsuccess for every request? Not every time. We can use event delegation instead. IndexedDB events bubble: request → transaction → database. All events are DOM events, with capturing and bubbling, but usually only bubbling stage is used. …But what if an error is fully handled? We don’t want to report it in that case. We can stop the bubbling and hence db.onerror by using event.stopPropagation() in request.onerror. By a key or a key range. That is: by book.id in our “books” storage. By another object field, e.g. book.price. We need an index for that. First let’s deal with the keys and key ranges (1). Methods that involve searching support either exact keys or so-called “range queries” – IDBKeyRange objects that specify a “key range”. IDBKeyRange.bound(lower, upper, [lowerOpen], [upperOpen]) means: between lower and upper, with optional equality if the corresponding open is true. IDBKeyRange.only(key) – a range that consists of only one key, rarely used. store.get(query) – search for the first value by a key or a range. store.getAll([query], [count]) – search for all values, limit by count if given. store.getKey(query) – search for the first key that satisfies the query, usually a range. store.getAllKeys([query], [count]) – search for all keys that satisfy the query, usually a range, up to count if given. store.count([query]) – get the total count of keys that satisfy the query, usually a range. For instance, we have a lot of books in our store. Remember, the id field is the key, so all these methods can search by id. Object store sorts values by key internally. So requests that return many values always return them in sorted by key order. To search by other object fields, we need to create an additional data structure named “index”. An index is an “add-on” to the store that tracks a given object field. For each value of that field, it stores a list of keys for objects that have that value. There will be a more detailed picture below. unique – if true, then there may be only one object in the store with the given value at the keyPath. The index will enforce that by generating an error if we try to add a duplicate. multiEntry – only used if there value on keyPath is an array. In that case, by default, the index will treat the whole array as the key. But if multiEntry is true, then the index will keep a list of store objects for each value in that array. So array members become index keys. In our example, we store books keyed by id. Let’s say we want to search by price. The index will track price field. The price is not unique, there may be multiple books with the same price, so we don’t set unique option. The price is not an array, so multiEntry flag is not applicable. As said, the index for each value of price (second argument) keeps the list of keys that have that price. The index keeps itself up to date automatically, we don’t have to care about it. Indexes are internally sorted by the tracked object field, price in our case. So when we do the search, the results are also sorted by price. The delete method looks up values to delete by a query, just like getAll. delete(query) – delete matching values by query. books.clear(); // clear the storage. Methods like getAll/getAllKeys return an array of keys/values. But an object storage can be huge, bigger than the available memory. Then getAll will fail to get all records as an array. Cursors provide the means to work around that. A cursor is a special object that traverses the object storage, given a query, and returns one key/value at a time, thus saving memory. As an object store is sorted internally by key, a cursor walks the store in key order (ascending by default). query is a key or a key range, same as for getAll. "next" – the default, the cursor walks up from the record with the lowest key. "prev" – the reverse order: down from the record with the biggest key. "nextunique", "prevunique" – same as above, but skip records with the same key (only for cursors over indexes, e.g. for multiple books with price=5 only the first one will be returned). The main difference of the cursor is that request.onsuccess triggers multiple times: once for each result. advance(count) – advance the cursor count times, skipping values. continue([key]) – advance the cursor to the next value in range matching or after key. Whether there are more values matching the cursor or not – onsuccess gets called, and then in result we can get the cursor pointing to the next record, or undefined. In the example above the cursor was made for the object store. But we also can make a cursor over an index. 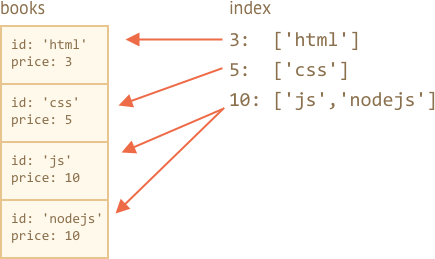 As we remember, indexes allow to search by an object field. Cursors over indexes to precisely the same as over object stores – they save memory by returning one value at a timee. Adding onsuccess/onerror to every request is quite a cumbersome task. Sometimes we can make our life easier by using event delegation, e.g. set handlers on the whole transactions, but async/await is much more convenient. Let’s use a thin promise wrapper https://github.com/jakearchibald/idb further in this chapter. It creates a global idb object with 記事 "promisify" が見つかりません IndexedDB methods. So we have all the sweet “plain async code” and “try…catch” stuff. If we don’t catch the error, then it falls through, just as usual. An uncaught error becomes an “unhandled promise rejection” event on window object. A we know already, a transaction auto-commits as soon as the browser is done with the current code and microtasks. So if we put an macrotask like fetch in the middle of a transaction, then the transaction won’t wait for it to finish. It just auto-commits. So the next request in it fails. For a promise wrapper and async/await the situation is the same. The next inventory.add after fetch (*) fails with an “inactive transaction” error, because the transaction is already committed and closed at that time. The workaround is same as when working with native IndexedDB: either make a new transaction or just split things apart. Prepare the data and fetch all that’s needed first. Then save in the database. Internally, the wrapper performs a native IndexedDB request, adding onerror/onsuccess to it, and returns a promise that rejects/resolves with the result. That works most fine of the time. The examples are at the lib page https://github.com/jakearchibald/idb. IndexedDB can be thought of as a “localStorage on steroids”. It’s a simple key-value database, powerful enough for offline apps, yet simple to use. The best manual is the specification, the current one is 2.0, but few methods from 3.0 (it’s not much different) are partially supported. Get a promise wrapper like idb. Create object storages in indexes in onupgradeneeded handlers. Update version if needed – either by comparing numbers or just checking what exists. Create transaction db.transaction('books') (readwrite if needed). Get the object store transaction.objectStore('books'). Then, to search by a key, call methods on the object store directly. To search by an object field, create an index. If the data does not fit in memory, use a cursor.